The principal aim of the legal operations movement is to treat in-house legal departments as business units that should be operated in large part as discrete businesses themselves. For purposes of speed, efficiency and cost control, a primary function of the occupants of this role is to ensure that their legal departments, as well as their external counsel, are deploying the latest and greatest technology. 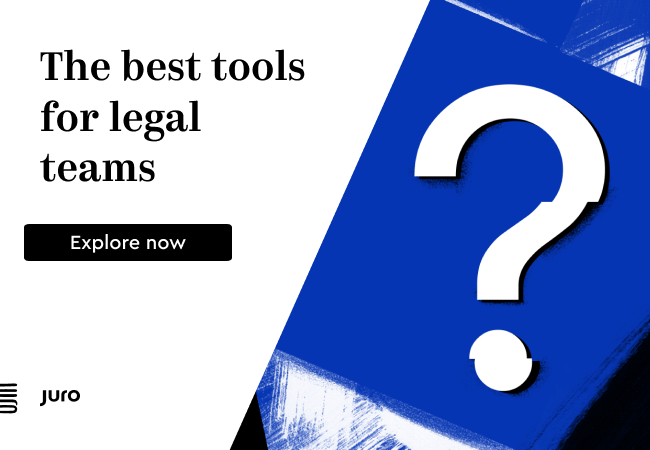 As legal ops comes to wield increasingly more power, law firms may have little choice but to adapt or be left behind. 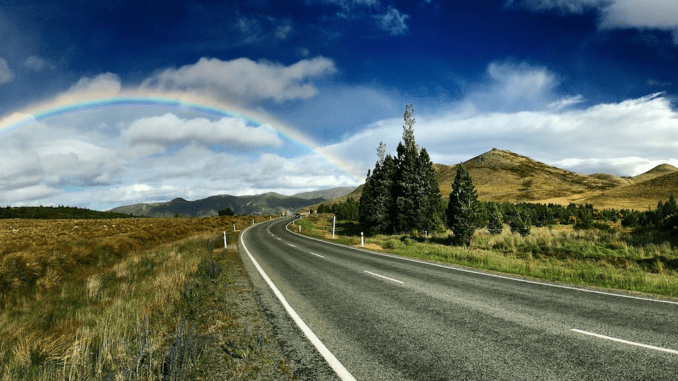 Part 2 of this series also explored the fact that the broad discretion afforded attorneys in choosing how to allocate their time in tackling a specific legal goal may yield wildly variable costs and levels of service. 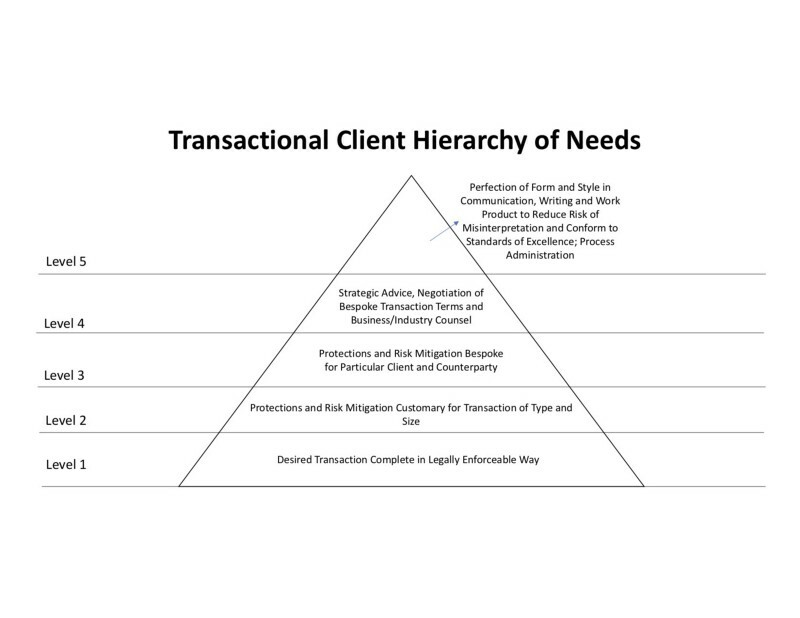 To address this problem, we would suggest that it is past time that the legal services industry established “Service Levels” based upon the hierarchy of client needs. With respect to transactional work, the relevant Service Levels may look something like the below. As you can probably tell, in the example from Part 2, Lawyer 1, Lawyer 2 and Lawyer 3 each provided different Service Levels: Lawyer 1 provided Level 2 service, simply making sure that the NDA contained customary terms and protections; Lawyer 2 provided Level 3 service, addressing certain low risk edge cases that aren’t necessarily customary; and Lawyer 3 provided Level 5 service, addressing form and style to reduce prospective error or misinterpretation. The point of introducing such a concept is that clients, not lawyers, should be choosing the Service Level with which they are provided by their attorneys. Clients aren’t currently given that opportunity, at least not formally. Sure, clients may say “take a quick look to make sure that nothing looks too crazy, but don’t spend a lot of time on this”, but too often lawyers allow that request to creep into Level 5 service when they start identifying minor stylistic, formatting and other issues that they’d like to change. Many lawyers, Type A personality types that they are, just can’t help themselves. Clients should be given, and should exercise, the right to choose their fee rate based on the Service Level that most closely conforms to their desired outcome. Unfortunately, the evolution of clients’ in-house legal functions and the implementation of Service Level-type standards may not solve all of the havoc wreaked by the billable hour. Some of the more intractable issues, such as the effects of Parkinson’s law as discussed in Part 3 of this series, may be difficult to solve when confined to the billable hour system. Perhaps it is this recognition that has led to the continued rise in alternative fee arrangements. It may be that this trend will continue unabated until spotting a billable hour on a legal bill becomes as rare an occurrence as catching a lawyer redlining by hand. So, we’ve engaged in this long exploration of the way that lawyers spend and report their time in an effort to engage in a meaningful, reality-based critique of the billable hour. We aren’t the first, and won’t be the last, to point out some of the flaws of the billable hour system, although we suspect that the calls for a new billing paradigm will continue to grow louder as new technologies introduce greater transparency and enable the systematization of attorney workflows. [ The first three essays can be found here: Part 1, Part 2 and Part 3. This fourth part, written by co-founders, Alex Nordholm and James Clarkin-Breslin, is reproduced here with the company’s kind permission.